Here’s a secret: smoking a duck sounds MUCH more difficult than it actually is. A lot of people tend to assume that if a recipe takes a long time, it’s too hard for them to handle- but that’s not true! The effort and time it takes to smoke the duck is totally worth it. Sure, smoking takes longer than just dropping the meat on a grill, but the end result is incredibly moist and full of flavor. A smoked duck is an awe-inspiring centerpiece for any meal. 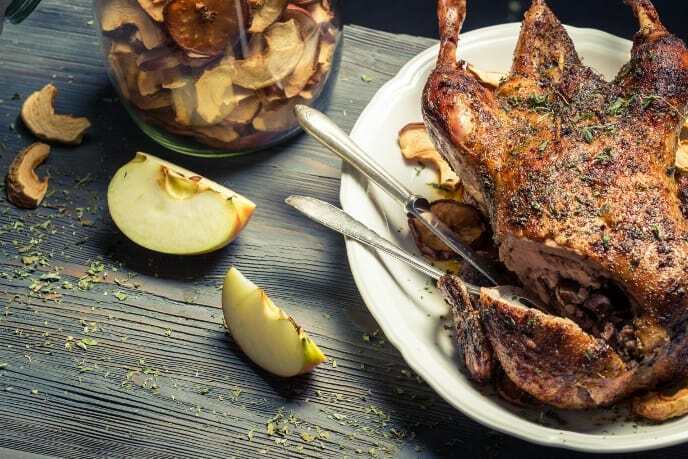 If you’re looking to impress someone, cooking a duck is a great way to show off your culinary skills and bring something mouthwatering and succulent to the table. You can make this recipe for occasions like holidays or parties, or for a normal family dinner! A treat like this is always a big hit, and you’ll get the satisfaction of watching everyone tuck into something special you made. It’s a feast for both the eyes and the mouth, and makes a fantastic centerpiece for a meal. Not to mention the leftovers (if it’s not all eaten up, that is)— once smoked, a duck can keep just fine for up to three weeks! That’s nearly a month of goodness to be used in any variety of recipes. After the initial meal, you can put your leftover duck in and on just about anything; make a salad, or duck covered toast, or mix it into a pasta. There’s an endless number of tasty combinations for you to try. And you can just as easily smoke more than one bird at a time, meaning even more deliciously ducky options. You won’t get tired of leftovers with this many possibilities. Now, on to the meat of the matter: how to ensure you get the best possible duck out of the recipe. The recipe works just as well on wild and domestic ducks, so you don’t have to worry about looking for a specific type. However, if you’re buying your duck at a grocery store, you should be sure to avoid the ones that have been pumped with brine— the brine will lead to a duck that’s too salty, and no one wants that. Bigger ducks smoke better, but there’s no reason not to smoke a small one. Duck is generally bolder and deeper in flavor than a turkey or a chicken, and they’re also fattier than most birds, making them perfect for smoking. Fatty meat retains the smoke flavor best, and ducks work great. Smoking the bird whole will give you a juicy, tender result, and taste better than cutting it beforehand. You want all those delicious juices to stay inside the bird while it cooks. Most smokers have areas that cook faster than others, so it can help to rotate your racks halfway through the cooking process to make sure the bird is cooked through evenly. An overcooked duck will be dry and tough and shrink up, and no one wants that. Follow the times given in the recipe and check in periodically, and you should be just fine. Another important (and fun) aspect of smoking meat is getting to pick out a wood that’s to your liking. 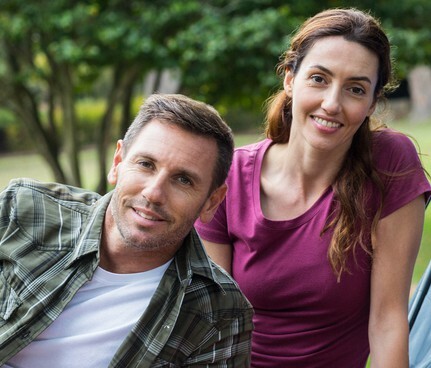 You can try out a few different types of wood to find your ideal flavor, but there’s some good guidelines to start with, especially if you’re not ready to experiment yet. Mesquite can have an overwhelming flavor, and you should steer clear unless you really know you like it. Pecan and apple wood, however, are always good options. Cherry wood also works quite well. If you’re really interested in this recipe, but don’t have a real smoker quite yet, that’s okay. We know not everyone has one, though a smoker provides the most consistent results. In a pinch, you can make a temporary smoker out of a normal charcoal or wood grill. How do you do this, you ask? Heat the coals until they’re white hot, and then spread them either to the outer edges of the bottom of the grill, or to one side. If you can, you should place a foil pan with a couple inches of water on a rack above the coals. When using a makeshift smoker like this, you should place the meat as far away from the hot coals as you can, because you want them to be cooked by the smoke, not by the coals themselves. Then, you place the lid on the grill, and adjust the airflow so it’s warm, rather than hot. Smoking is a slow cooking method, but you’ll get a juicier result than just popping it on the grill normally. This recipe is meant for a 5 pound duck, so if you decide to smoke a 2.5 pound duck, you should halve your ingredients. Remember that ducks have heavier bones than a lot of fowl, so you might think it sounds like more than it is if you’re just basing it on weight! This smoked duck recipe is one of my favorite recipes to cook during the holidays. Not everyone has poultry seasoning lying around, and some prefer to make their own, especially as it can often be cheaper! Here’s a recipe for homemade poultry seasoning. For the poultry seasoning, all you do is mix all the ingredients thoroughly and store your seasoning in a clean spice bottle, tightly covered. You can make this seasoning beforehand, and then use 2 teaspoons of it in your cure. The early prep takes place about a week before you plan to smoke your duck. First, you wash the duck (or ducks!) and remove any excess fat from the body, leaving the skin intact. Pierce the thighs and breasts multiple times with a sharp fork. You should try to pierce the skin, but not the meat underneath. This helps release fat. Mix the cure recipe together in a large bowl or container. Then, rub the cure over the duck, both inside and out. Cure the duck for six days in the refrigerator. While it’s curing, periodically continue to rub the cure over and inside the duck. This is to help ensure the cure will penetrate your duck and work as intended. The secondary preparation takes place one day before you mean to smoke your duck. First, rinse your duck with cool water and then blot dry. It’s important that the duck be entirely dry by the time it is smoked. Tip: If you feel you have the time for it, instead of entirely drying your duck off with towels, at this point you can place the duck on a wire rack in the refrigerator and let it air dry for 24 hours. If you have less time, you can blow dry the duck with a hairdryer on a low temperature. This gives you a crispier skin. Crumple up newspaper, and then wrap the newspaper in paper towels. Stuff the duck’s body cavity with the newspaper-towel combo. Wrap the duck with paper towels, and then wrap it again with newspaper. It’s like a paper turducken! Place paper towel and newspaper under your wrapped duck to absorb any fluids. Store your duck overnight in the refrigerator like this. 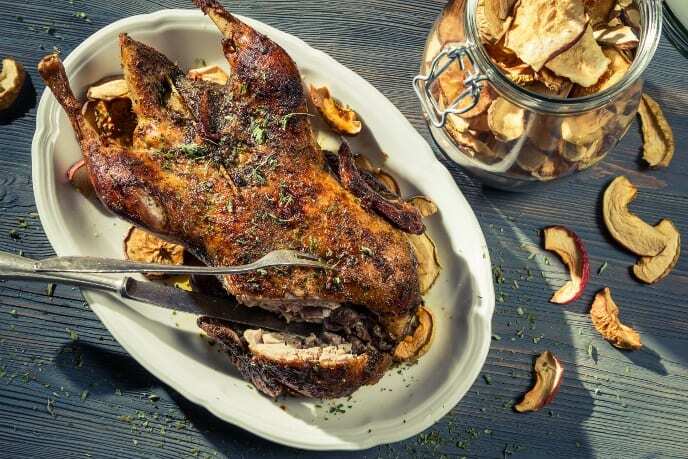 Remember to leave yourself plenty of time before you want to eat, as smoking a duck can take a long time- this recipe asks for your duck to be in the smoker at varying temperatures for seven hours. 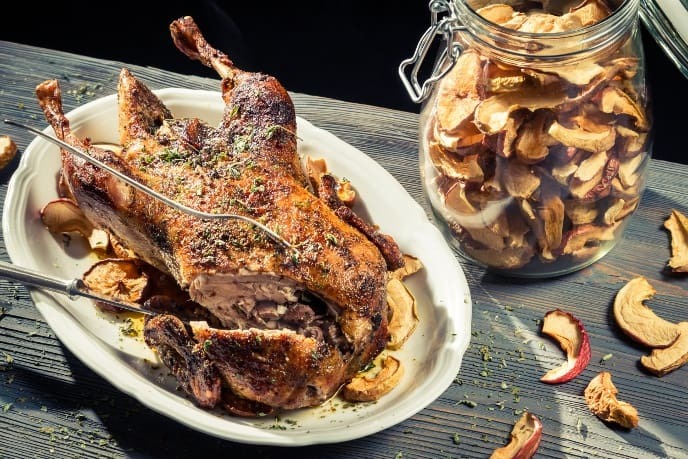 There are a variety of ways to smoke a duck, but for this recipe we’re going with hot smoking, which cooks faster than some of the other options, and is best for beginners. Before smoking your duck, remove the newspaper and towels that you wrapped it in last night. The next thing you should do is secure the duck with butcher’s twine, and either hang or place the duck into the smoker, with the breast facing down. If you can hang your duck, putting it on a sturdy hook with the tail facing upwards will allow the smoke to penetrate the body cavity more easily. If you don’t want to hang your duck, simply placing it in the smoker also works just fine! You should first dry the duck out in the smoker for an hour at 140° F. This is done with no smoke, just heat, and removes any unpleasant sliminess or stickiness on the skin. Now you can smoke your bird! Smoke the duck for around three hours (using your chosen wood!) at the lowest possible temperature for your smoker. If you want to, you can place a drip pan underneath your duck, and later brush the bird with the fat from the drip pan. After three hours, turn the temperature up to 150° F and smoke for three more hours. After this, you can remove your duck from the smoker. Preheat your oven to 350° F, and place the duck on an elevated war rack, and then place the rack into a pan. The pan needs to be at least an inch deep, in order to hold the melted fat! Cover the pan with aluminum foil, and roast the duck until done. 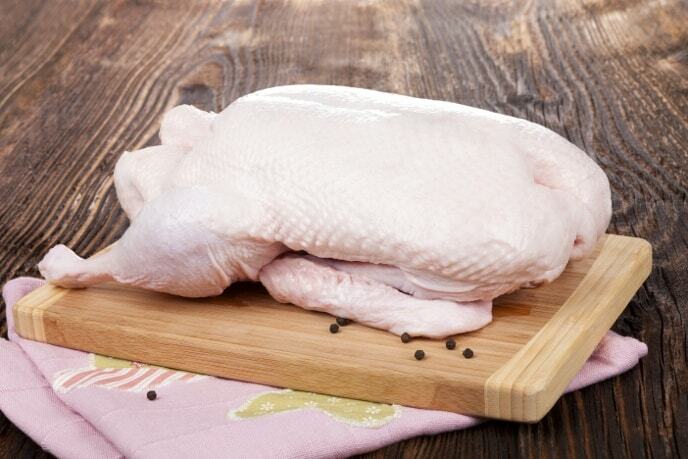 The internal temperature of your duck should reach 170° F, which can be monitored with a digital probe thermometer. When the duck’s done, it should also be easy to wiggle the drumsticks. Take your duck out, and let it rest on a cutting board for five minutes before serving, to make sure it comes out as juicy as possible! It’s important to note that not all smokers smoke evenly, and not all ovens cook evenly. As a result, different ducks in different places on the smoker or oven may not be done at the same time. Use you discretion, and deal with it bird by bird- when a duck is done, take it out, even if the others aren’t. A finished duck should have crisp skin, and be cooked through. Hells Kitchen apt., even the fire escape isnt big enough for a grill. But a week of brining as Charlie directed, two hours in the oven at 350…pix on request. Unctuous and crisp, the meat is juicy and insinuating with pecan chips (makeshift smoker from a loaf pan). Will do again. Awesome guidance! !